Point guard Stephen Curry. 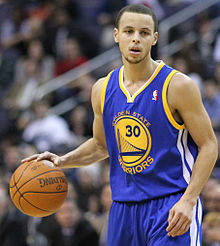 Curry won three NBA championships with the Golden State Warriors. The point guard (PG), also called the one or point, is one of the five positions in a regulation basketball game. A point guard has perhaps the most specialized role of any position. Point guards are expected to run the team's offense by controlling the ball and making sure that it gets to the right player at the right time. Above all, the point guard must totally understand and accept their coach's game plan; in this way, the position can be compared to a quarterback in American football or a playmaker in association football (soccer). While the point guard must understand and accept the coach's gameplan, they must also be able to adapt to what the defense is allowing, and they also must control the pace of the game. A point guard, like other player positions in basketball, specializes in certain skills. A point guard's primary job is to facilitate scoring opportunities for his/her team, or sometimes for themselves. Lee Rose has described a point guard as a coach on the floor, who can handle and distribute the ball to teammates. This involves setting up plays on the court, getting the ball to the teammate in the best position to score, and controlling the tempo of the game. A point guard should know when and how to instigate a fast break and when and how to initiate the more deliberate sets. Point guards are expected to be vocal floor leaders. A point guard needs always to have in mind the times on the shot clock and the game clock, the score, the numbers of remaining timeouts for both teams, etc. Among the taller players who have enjoyed success at the position is Ben Simmons, who at 6’ 10” won the 2018 National Basketball Association Rookie of the Year Award. Behind him is Magic Johnson, who at 6’ 9” (2.06 m) won the National Basketball Association Most Valuable Player Award three times in his career. Other point guards who have been named NBA MVP include Russell Westbrook, Bob Cousy, Oscar Robertson, Allen Iverson, Derrick Rose and two-time winners Steve Nash and Stephen Curry. In the NBA, point guards are usually about 6' 4" (1.93 m) or shorter, and average about 6' 2" (1.88 m) whereas in the WNBA, point guards are usually 5' 9" (1.75 m) or shorter. Having above-average size (height, muscle) is considered advantageous, although size is secondary to situational awareness, speed, quickness, and ball handling skills. Shorter players tend to be better dribblers since they are closer to the floor, and thus have better control of the ball while dribbling. After an opponent scores, it is typically the point guard who brings the ball down court to begin an offensive play. Passing skills, ball handling, and court vision are crucial. Speed is important; a speedy point guard is better able to create separation and space off the dribble, giving him/herself room to work. Point guards are often valued more for their assist totals than for their scoring. Another major evaluation factor is assist-to-turnover ratio, which reflects the decision-making skills of the player. Still, a first-rate point guard should also have a reasonably effective jump shot. Steve Nash led the NBA in assists five times. The point guard is positioned on the perimeter of the play, so as to have the best view of the action. This is a necessity because of the point guard's many leadership obligations. Many times, the point guard is referred to by announcers as a "coach on the floor" or a "floor general". In the past, this was particularly true, as several point guards such as Lenny Wilkens served their teams as player-coaches. This is not so common anymore, as most coaches are now solely specialized in coaching and are non-players. Some point guards are still given a great deal of leeway in the offense. Even point guards who are not given this much freedom, however, are still extensions of their coach on the floor and must display good leadership skills. Along with leadership and a general basketball acumen, ball-handling is a skill of great importance to a point guard. Generally speaking, the point guard is the player in possession of the ball for the most time during a game and is responsible for maintaining possession of the ball for his team in the face of any pressure from the opponents. Point guards must be able to maintain possession of the ball in crowded spaces and in traffic and be able to advance the ball quickly. A point guard that has enough ball-handling skill and quickness to be able to drive to the basket in a half-court set is also very valuable and considered by some to be a must for a successful offense. After ball-handling, passing and scoring are the most important areas of the game for a point guard. As the primary decision-maker for a team, a point guard's passing ability determines how well a point guard is able to put his decision into play. It is one thing to be able to recognize the player that is in a tactically advantageous position, but it is another thing entirely to be able to deliver the ball to that player. For this reason, a point guard is usually, but not always, more skilled and focused on passing than shooting. However, a good jump shot and the ability to score off a drive to the basket are still valuable skills. A point guard will often use his ability to score in order to augment his effectiveness as a decision maker and play maker. In addition to the traditional role of the point guard, modern teams have found new ways to utilize the position. Notably, several modern point guards have used a successful style of post play, a tactic usually practiced by much larger centers and forwards. Working off of the fact that the opposing point guard is in all probability an undersized player with limited strength, several modern point guards have developed games close to the basket that include being able to utilize the drop step, spin move, and fade away jump shot. Stephen Curry is one of the best scoring point guards in NBA history. In recent years, the sport's shift from a fundamental style of play to a more athletic, scoring-oriented game resulted in the proliferation of so-called combo guards at the point guard position. More explosive and athletic point guards focus on scoring as opposed to play-making, forgoing assists and ball-movement, and often defense, for higher scoring numbers. Young players who are relatively short are now developing the scoring aspects of their skill-sets, whereas previously these players would find it difficult to enter the NBA without true point guard skills. These combo point guards can surprise defenses. Instead of passing after bringing up the ball they quickly drive to the basket or step back for an outside shot. There are some disadvantages to this style of play. A point guard often controls the offense and he also controls who gets the ball and who doesn't, as this type of controlling style of play is necessary to control the tempo of a game. Scoring point guards typically look to score first, thus preventing teammates from getting the ball. This can cause other players to become dis-involved in the offense. Even so, combo guards still require above-average passing skill, but not as much as possessed by "pure" point guards (which is what those in the traditional mold of a point guard are referred to). Gary Payton, a point guard known for defensive prowess. A point guard primarily defends on the perimeter, just as he primarily plays on the perimeter on offense. On defense, the point guard is tasked with making the opposing point guard as ineffective as possible. A defensive point guard will try to accomplish this with constant pressure on the ball, making it difficult to maintain possession. A defensive point guard will also pressure opponents in passing lanes in an attempt to generate steals and scoring opportunities for his own team. Wikimedia Commons has media related to Point guards.